Whether you’re looking to toast your travels, fill some downtime, or simply celebrate navigating your way through check-in and security, there’s something particularly refreshing about grabbing a beer at the airport. Fortunately, many airports across North America have upped their dining and drinking options in recent years, with hundreds of airport bars pouring passengers the perfect pint. We’ve rounded up post-security beer stops at 20 top airports in North America, not only because we want to prep for Oktoberfest but also because a trip through airport security sometimes requires a cold one. So, next time you book a flight (found on Cheapflights.ca, of course), you can easily find the most convenient pre-flight pint. Cheers! ATL | Hartsfield-Jackson Atlanta International Airport, Atlanta, Georgia, U.S.
BWI | Baltimore-Washington International Thurgood Marshall Airport, Baltimore, Maryland, U.S.
DEN | Denver International Airport, Denver, Colorado, U.S.
EWR | Newark International Airport, Newark, New Jersey, U.S.
FLL | Fort Lauderdale-Hollywood International Airport, Fort Lauderdale, Florida, U.S.
HNL | Daniel K. Inouye International Airport, Honolulu, Hawaii, U.S.
JFK | John F. Kennedy International Airport, New York, New York, U.S.
LAS | McCarran International Airport, Las Vegas, Nevada, U.S.
LAX | Los Angeles International Airport, Los Angeles, California, U.S.
LGA | LaGuardia International Airport, New York, New York, U.S.
MCO | Orlando International Airport, Orlando, Florida, U.S.
MIA | Miami International Airport, Miami, Florida, U.S.
MSP | Minneapolis-St. Paul International Airport, Minneapolis, Minnesota, U.S.
ORD | Chicago O’Hare International Airport, Chicago, Illinois, U.S.
PHL | Philadelphia International Airport, Philadelphia, Pennsylvania, U.S.
SAN | San Diego International Airport, San Diego, California, U.S.
TPA | Tampa International Airport, Tampa, Florida, U.S. Massive Hartsfield-Jackson Atlanta International Airport in Atlanta offers beer stops in every terminal. Here’s where you can find a brew once you get to your concourse. Concourse T: Choose from a selection of Sam Adams favourites and seasonal brews at Sam Adams/Checkpoint Bistro between gates T7 and T8. Concourse A: Located on the upper level, Gordon Biersch is ideal for a quick pint. Concourse B: Look for TGI Fridays right near the food court or opt for the nearby Blue Moon Brewhouse. Concourse C: There aren’t too many options here, but you can head to Longhorn Steakhouse across from gate 12 for ice cold beer. Concourse D: Atlanta Braves All-Star Grill awaits near gate D10, but you may spot the signs for the Buffalo Wild Wings on the upper level in the centre of the concourse first. Concourse E: There are watering holes right in the middle of the terminal, with trendy and upscale One Flew South and a more basic option simply called The Bar. Concourse F (International): Enjoy a Belgian beer at Maison Mathis before your international flight. Passengers don’t have to walk far to find beer post-security at BWI Marshall Airport in Baltimore. Concourse A: The Flying Dog Tap House, Maryland’s largest brewery, has an outpost, just past security. Concourse B: The Silver Diner has a number of beers by the bottle and on tap. Concourse C: British pub Firkin & Flyer greets passengers post-security. Concourse D: Casual sports bar The Greene Turtle near gate D8 is your best bet. Concourse E: Thirsty passengers should take a detour to adjacent Concourse D since there are no beer-selling establishments in Concourse E.
A Gates: Options include Lefty’s Colorado Trail Bar and Grille near gate A48; Vino Volo near gate A49; Chef Jimmy’s Bistro & Spirits and Denver Chophouse at the centre of the A gates; and Mesa Verde Bar & Grill in the A gates mezzanine. B Gates: You have a wide array of choices, including Etai’s near gate B23; New Belgium Hub near gate B60; Elway’s at the centre of the B gates; Aviator’s Sports Bar & Bar-B-Que, Wolfgang Puck and Lounge 5280 Wine Bar in the B gates mezzanine; Colorado Sports Bar near gate B30; and Crú Food and Wine Bar near gate B51. C Gates: The C gates are also well stocked with pre-flight drinking holes, including Tapas Sky Bar near gate C24; Coors Silver Bullet Bar near gate C29; Rock Bottom Restaurant & Brewery near gate C32; Vino Volo near gate C49; and Root Down and Timberline Steaks & Grille at the centre of the C gates. Jeppensen Terminal: Pick from Boulder Beer Tap House at Level 5 West, Red Rocks Bar & BBQ at Level 5 East, or Cantina Grill on Level 6 East. The options are limited in parts of at Newark International Airport, but passengers don’t have to travel far to find beer in each of the airport’s 3 terminals, each of which have 3 security checkpoints. 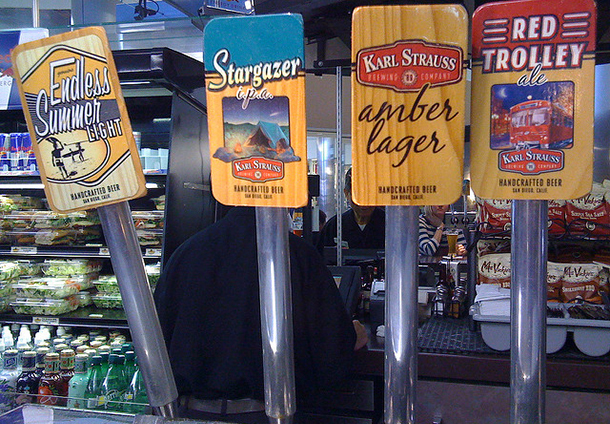 Terminal A: Tony Roma’s serves a variety of beers on tap and is located just steps from the security checkpoint. Terminal B: Belgian Beer Café is the closest beer to passengers headed to gates B50-B57; Champps is ideal for folks headed to flights departing from gates B40-B47; and McGinley’s Pub is the most convenient stop for travellers departing from gates B60-B68. Terminal C: Choose from Vesper Tavern at gate C70-C99, Abruzzo Italian Steakhouse near gates C70-C99, and Caps Beer Garden at gates C120-C139. 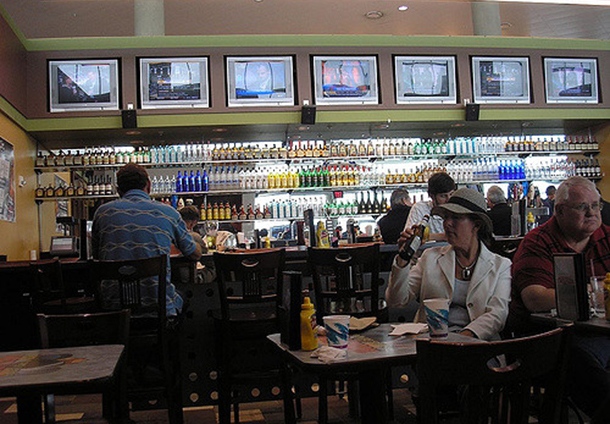 The airport’s quartet of terminals offer ample opportunity for a cold one before departing sunny South Florida. Terminal 1: Terminal 1 has a trio of concourses — A, B and C — with options in each that are a short stroll from security. Concourse A is temporarily home to Bud Light Bar for ice cold Budweiser beer, BurgerFi for burgers and brews, and La Familia Tacos & Tequila for tacos, tequila and (of course) beer. Concourse B has craft beers at Landshark Bar, and Concourse C has several beers on tap at Shula Burger. Terminal 2: Concourse D offers up beer and wine alongside American favourites at Miami Grill, or wash down pizza and meatballs at Torn Basil with a cold one. Terminal 3: Your best bet is in Concourse F at Food Network Kitchen, where you can enjoy food and beer from the foodie-focused network. At the far end of the JetBlue terminal is Blue Bar. Terminal 4: Have a beer at Casa Noble in Concourse G, or indulge in one of their tequilas or exclusive cocktails. If you’re in Concourse H, head to Kafe Kalik for a beer or specialty drink. 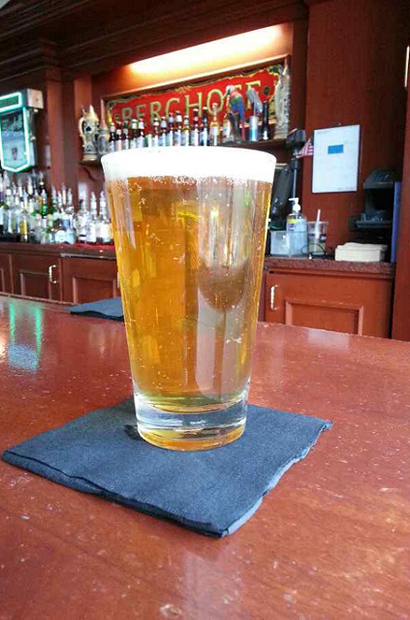 You don’t have to walk far past security for an ice cold beer in Honolulu. Terminal 1: You’ll find the full-service Cocktail Lounge near gates 49-53. Terminal 2 – Interisland: Head to Stinger Ray’s Tropical Bar & Grill, which serves colourful cocktails and brews along with bar food. Terminal 3 – Central: Golf aficionados can sample the Big Island’s own Kona Longboard and Kona Seasonal at PGA Tour Grill near gate 14 on level 2. Terminal 3 – Main: Walk around the concourse for local Hawaiian microbrews at Atrium Bar, or indulge in tacos, tequila and beer at Jose Cuervo Tequileria on level 2. Terminal 3 – Diamond Head: Pop into Island Brews for a quick beer, or head to Torn Basil for a microbrew alongside a slice of pizza at gate 8 on level 2. Terminal 3 – Ewa: Brewpub Gordon Biersch serves comfort food and beer on level 2. Each of the airport’s terminals offers post-security brews. Terminal 1: Craft beers are served at Martini Bar presented by Panini Express near gate 9. Terminal 2: Croque Madame serves French fare and a shortlist of beers from around the globe at gates 62-63. A few metres away, BKLYN Beer Garden has 20 beers on tap paired with beer garden favourites like knockwurst, beer sausage and cheddar bratwurst by Chef Laurent Tourondel, located opposite gate 67. Terminal 4: Head to Shake Shack adjacent to gate B23 for a ShackBurger; a cheeseburger with lettuce, tomato and ShackSauce, and a ShakeMeister Ale, brewed exclusively for Shake Shack by Brooklyn Brewery. Terminal 5: Mere steps from security in Terminal 5 is a marketplace filled with a collection of restaurants. Choose from beer and tapas at Piquillo; brews and burgers at 5ive Steak; pints and pizza at AeroNuova; or sushi and beer at Deep Blue on the Fly. Terminal 7: Tiny Terminal 7 offers a plethora of beer options, including the aptly-named Thirsty Beer & Wine Bar between gate 6 and gate 7, and the slightly out-of-the-way Trafalgar Pub at gate 10. Terminal 8: Terminal 8 offers cold ones in the concourse at Bobby Van’s Steakhouse across from gate 14, the company’s only airport location. 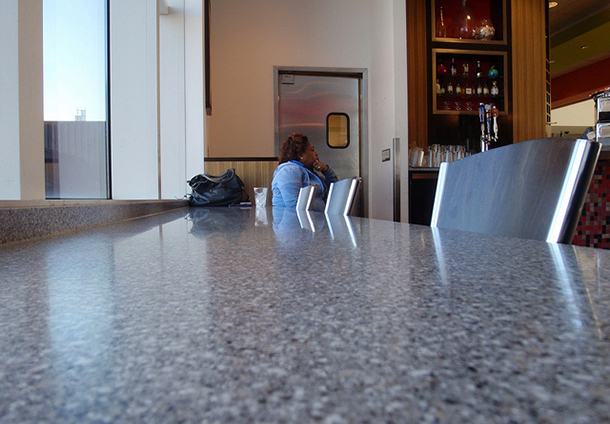 Drown your sorrows at not winning big in Las Vegas at the airport’s many bars. 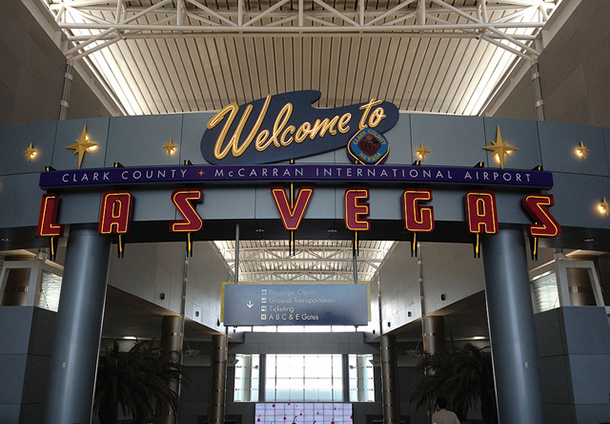 McCarran International Airport’s 110 gates are situated in 2 terminals; however, passengers are never far from beer or slot machines. Terminal 1 is home to the A, B, Cand D gates, while Terminal 3 is home to additional D and E gates. Terminal 1: The closest post-security beer is Barney’s Lounge, a full bar adjacent to security at the C gates. There are additional beer stops a bit deeper into the terminal, including Crafted, Jose Cuervo Tequileria, Lucky Streak and Sammy’s Beach Bar & Grill. 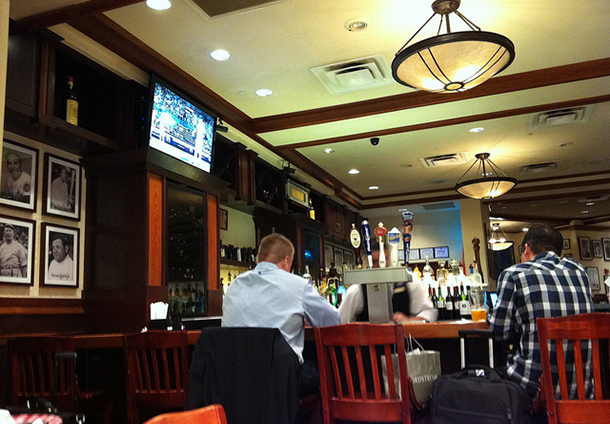 Terminal 3: In Terminal 3, the closest pint post-security is at steakhouse Las Vegas Chophouse & Brewery with additional options that include The Local and Village Pub, which offers video poker near the E gates. 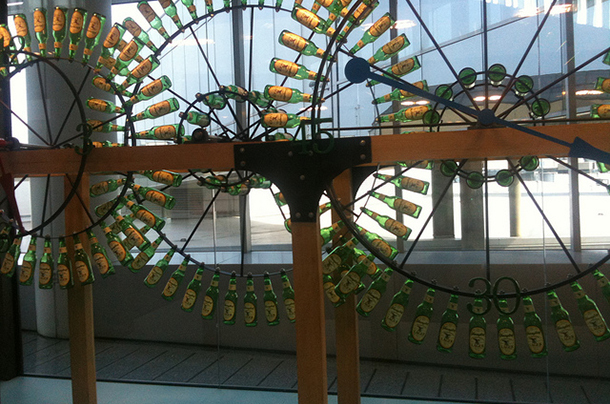 The palatial airport’s 9 terminals each offer plenty of places to chug-a-lug beer in Los Angeles. Terminal 1: Head to Gordon Biersch in the food court, or Rock & Brews Concert Bar and Grill and Reilly’s Irish Pub in the concourse. Terminal 2: Craft beers and custom burgers are on offer at BUILT [Custom Burgers]. Terminal 3: Grab a ShackBurger at Shake Shack, a cheeseburger with lettuce, tomato and ShackSauce, and wash it down with a ShakeMeister Ale, or sample seasonally-changing local brews at Angel City Brewery. Terminal 4: Sammy’s Woodfired Pizza & Grill is the sole beer stop in Terminal 4. Terminal 5: Sip beer with a side of rock ‘n’ roll at Rock & Brews Concert Bar & Grill, or sample more than a dozen draft and bottled beers at Ford’s Filling Station in Terminal 5. Terminal 6: From draft beer at The Wine Bar by Wolfgang Puck and The Kitchen by Wolfgang Puck; to craft brews from Golden Road Brewing at Point the Way Café; to fine Italian cuisine and beer at “Top Chef” Fabio Viviani’s Osteria by Fabio Viviani; to Hollywood favourite Blu2o; there are plenty of options in the recently renovated Terminal 6. Terminal 7: Before proceeding to your gate, stop for custom burgers and brews at The Counter: Custom Built Burgers, sandwiches, flatbread pizza and draft beers at Rolling Stone Bar & Grill, or tuck into steak and beer at B Grill by BOA Steakhouse. 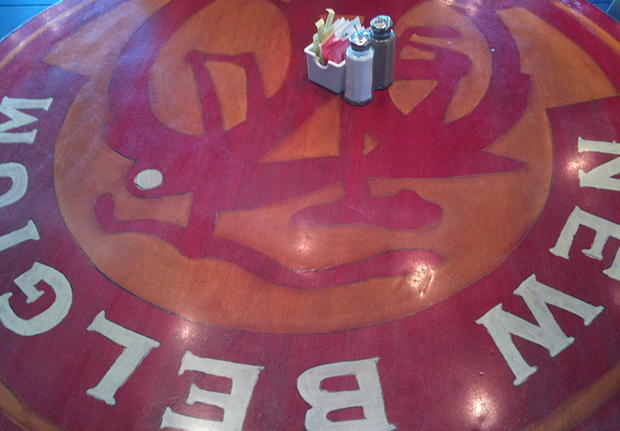 Terminal 8: Firehouse favourites and draft beers are served pre-flight at Engine Co. No. 28, or enjoy a beer at Corona Bar. 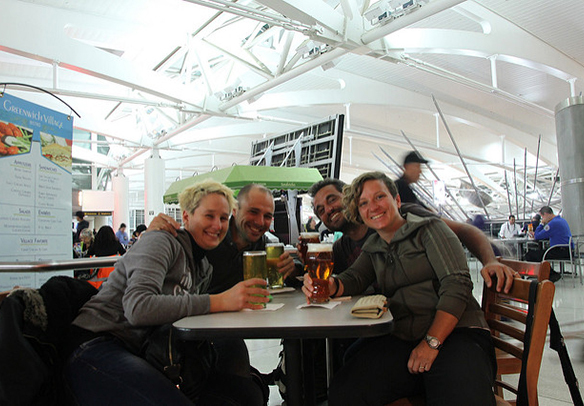 International Terminal: The International Terminal is packed with options that include wine bar Vino Volo; craft burgers and beer at Umami Burger; draft beer at sports bar Scoreboard LA; Japanese fare and beer at Luckyfish; or fish tacos and pints at James’ Beach. For years, the food and drink options have been bare at LaGuardia International Airport. Terminal A: If your flight leaves from Terminal A, there are no beer options and only one sole coffee shop post-security. Terminal B: Options in Terminal B are better, where beer can be found on the menus at sports bar Metro Burger Bar and Sam Adams Bar. Terminal C: In Terminal C, among the numerous Italian and pizza restaurants (Artichoke Pizza, Cotto and Crust are all here) are Biergarten, with 24 craft, local and international beers on tap; Empire Tavern, a classic New York tavern; and Wibar, a wine bar that also serves ice cold beer and small plates. Terminal D: Pale ales and IPAs can also be found at Minnow, Prime Tavern and Wibar. It’s quite easy to access food and beer at Orlando International Airport. After taking a tram to one of 4 terminals (the main terminal is open to the public and features an extensive collection of restaurants), it’s only a few feet more for an ice cold treat. Airside 1: There are tasty beers at Urban Crave to the left between gates 1-9, ice cold cervezas at On the Border, and beer at the brasserie Le Grand Comptoir to the right between gates 20-29. Airside 2: Head to Cask & Larder, which boasts 2 bar areas, a 220-seat restaurant, a commissary and grab-and-go area serving farm-to-terminal dining between gates 100-129. Airside 3: Local healthy fare is paired with tasty brews at Camden Food Co. between gates 40-49. Airside 4: Enjoy a frosty Foster’s lager and a Bloomin’ Onion at Outback Steakhouse between gates 70-99 before boarding. The airport that is gateway to Latin America is home to many stops for a final beer before departing the Sunshine State. Terminal D – West: Grab a pint at The Clover Irish Pub, a well-reviewed post-security pub serving up fish and chips and shepherd’s pie alongside a solid selection of brews. Terminal D – East: Quench your thirst and kill time before your flight at Corona Beach House, or enjoy a local craft beer from the likes of Miami Brewing or Funky Buddha at Shula’s Bar & Grill. Terminal E: While small, Samuel Adams does the trick in Terminal E.
Terminal F: Budweiser Brew House is ideal for a quick pre-flight pint. Terminal G: You’re not seeing double, there’s also a Budweiser Brew House in Terminal G.
Terminal H: Trade that Bud for a Heineken at Heineken Bar in Terminal H.
Terminal J: Stop on at Corona Beach House to keep the sunshine feel going. There are plenty of pints to enjoy in Minneapolis. Terminal 1 – Concourse A: Itasca Grill services comfort food like nachos and wings along with ice cold beer. Terminal 1 – Concourse B: The sole option in Concourse B is sports bar Home Team Sports Bar & Deli. Terminal 1 – Concourse C: Travellers have 3 options: Rock Bottom Brewery, Twins Grill and Vino Volo. Terminal 1 – Concourse D: Grab a craft beer and a burger at Republic in Concourse D.
Terminal 1 – Concourse E: Enjoy a beer at LoLo American Kitchen or Red Cowin Concourse E.
Terminal 1 – Concourse F: The largest organic bakery in the U.S., French Meadow Bakery & Café, not only offers healthy salads and sandwiches but also a range of draft, bottled and canned beer, which is also home to great brews at Ike’s on Summit and O’Gara’s Bar and Grill. Concourse G: here are options every few feet – literally – at watering holes like Mill City Tavern, Mimosa, Minnibar, Shoyu, Vero and Volante. Terminal 2 – Humphrey: There are a trio of belly-up-to-the-bar options in Concourse H, including tacos, huevos rancheros, margaritas and beers at Cocina del Barrio; the hockey-themed Minnesota Wild Bar complete with a bar made from hockey sticks; and wine bar Surdyk’s Flights, which serves beer and wine on tap. Chicago O’Hare International Airport’s 4 terminals offer multiple opportunities to toast travels. Terminal 1: Choose between Goose Island Beer Company at gate B1 in Concourse B and gate C10 in Concourse C; or Galileo’s Bar & Grill at gate B19; and La Tapenade at gate B4, both in Concourse B.
Terminal 2: Enjoy a diverse selection of wine and beer at La Tapenade’s full bar at gate F20 in Concourse F, or or raise a beer to Chicago’s pro hockey team, for which Stanley’s Blackhawks Kitchen & Tap at gate E3 in Concourse E is named. Terminal 3: Your options are many in Terminal 3. Take your pick from local brewery Goose Island Beer Company at gate L10A in Concourse L; Chicago Cubs Bar & Grill in the Terminal 3 rotunda, Facades Bar at gate K15 in Concourse K; ICE Dishes and Drinks in gate L1 in Concourse L; O’Brien’s Restaurant & Bar at gate H5 in Concourse H; Prairie Tap at gate K4 in Concourse K, and Publican Tavern at gate K1 in Concourse K.
Terminal 5: Hub 51 at gate M10 in Concourse M offers local beers, as well as wine and cocktails. For Italian favourites, try Tocco in Concourse M at gate M7. For Mexican food paired with a hand-shaken margarita or cold beer, try Tortas Frontera by Rick Bayless in Concourse M at gate M12. The airport’s 7 terminals are packed with options. Don’t miss the signature crab fries at Chickie’s & Pete’s in Terminals A-West, C, D and E. Not a seafood fan? No problem. There are plenty of other places to grab a beer. Terminal A – East: Enjoy Irish pub food and a pint at Jack Duggan’s Pub & Restaurant. Terminal A – West: A Mediterranean restaurant, La Tapenade offers up beer as well as light and tasty fare. Terminal B: Try sports bar Jet Rock Bar & Grill with 42 local and craft beers on tap. Terminal C: You have a good selection here with options ranging from Italian bar Cibo Bistro & Wine Bar and Italian eatery Aldo Lamberti Trattoria to Japanese-styled Sky Asian Bistro and iconic seafood restaurant Legal Sea Foods. Terminal D: Enjoy wine and beer at Vino Volo in Terminal D (with an additional location in the connector between Terminals B and C). Chef Michael Symon’s Bar Symon is also opening soon in Terminal D.
Terminal E: Pair beer with grilled Mexican fare at Cantina Laredo. Terminal F: Beer emporium Local Tavern offers up 60 taps and iPads at each bar stool. After traversing the TSA, passengers at San Diego International Airport can grab a round or 2 at several watering holes. Terminal 1: Take your pick from Bankers Hill Bar & Restaurant for craft beer and farm-to-table eats locally-brewed beers and California fare at Craft Brews on 30th Street; custom burgers and brews at The Counter: Custom Built Burgers; and street food and beer at Urban Crave. Terminal 2: Options include healthy eats and beers at golf-themed PGA Tour Grill; local favourite Prado at the Airport, a spin-off of the Escondido, Calif restaurant; or local brews from craft brewery Stone Brewing. SEA | Seattle-Tacoma International Airport, Seattle, Washington, U.S.
Each cluster of gates post-security features a variety of places to stop for a round or two in Seattle. Central Terminal: Here you can choose from Anthony’s Restaurant, Ivar’s Seafood or Vino Volo. 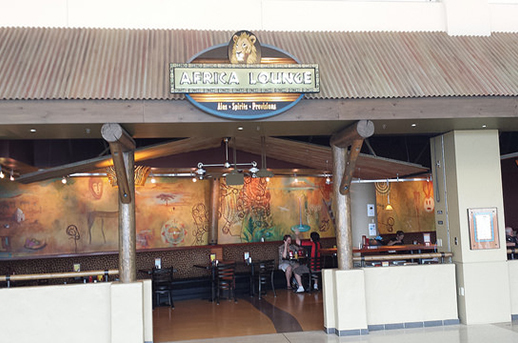 Concourse A: You’ll find a selection of beers at either Africa Lounge or Mountain Room Bar. Concourse B: Go local at the Seattle Taproom. Concourse C: Pair a pint with Beecher’s Handmade Cheese or have a quick brew at Waji’s. Concourse D: Choose between Alaska Lodge and Sports Page Pub for a pre-flight beer. The North Satellite: Sasquatch may be a myth, but the beer at Bigfoot Food & Spirits is very real. The South Satellite: Grab a bite and a brew at Dungeness Bay Seafood House before your flight. There aren’t many options for an ice cold beer in any of Luis Munoz Marin International Airport’s 4 terminals. Terminal A: There aren’t any options for beer in Terminal A.
Terminal B: Air Margaritaville serves draft beer and bottled beer along with margaritas and boat drinks. Terminal C: V Bar offers sandwiches, snacks and beer, while Landshark Bar also serves up pre-flight brews. Terminal D: There isn’t much by way of food or drink in Terminal D, so plan accordingly. The best part of eating and drinking at Tampa International Airport is the presence of outposts of local favourites in all 4 terminals. Airside A: Domestic beers await at Ducky’s between gate 9 and gate 10. Airside C: RumFish Grill, the sister restaurant to RumFish Grill on St. Pete Beach, features a nearly 2-metre aquarium and ice cold beer. Airside E: The Irish pub Four Green Fields is the closest post-security pint, but don’t miss the Spanish fare and beer at Columbia Café, the sister restaurant to the beloved family-owned Ybor City establishment, which is Florida’s oldest restaurant. Airside F: Just steps from security at Airside F you’ll find The Eatery, a 715 square metre market with 6 restaurants, including Liquid Provisions, a full-service bar offering a carefully curated collection of beers. Passengers don’t have to walk far at Toronto’s busiest airport to find beer. Terminal 1: Options include Mill St. Brewery, which serves year round, seasonal and special beers, at gate D20. Modelled after the city’s”Red Rocket” transit system, the Red Rocket diner serves 6 draft and 2 bottled beers at gate D51. Terminal 3: Head to Fionn MacCool’s at gate B24 and order their draught of the day for less than CA$5 (they also have live music). Beerhive at gates B26 and B27 is also an option and boasts 15 local and international drafts. Do you have a favourite airport bar? Let us know in the comments below. And now that you know the quickest route to a post-security beer at 20 of North America’s topairports, head over to Cheapflights.ca to get started searching for flights to your next getaway.